VietNamNet Bridge – The traditional long tunic and trousers of Vietnam, or Ao Dai, has always been seen as a cultural symbol of the country and people of Vietnam. However, few know that this traditional outfit appeared very early and experienced a lot of ups and downs. 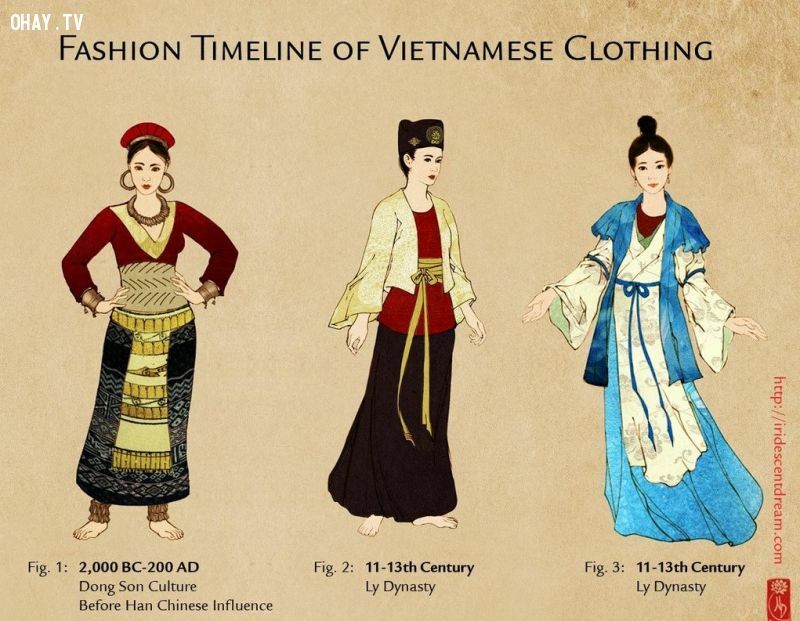 Illustration of the evolution of the Vietnamese Ao Dai from the Dong Son culture to the Ly Dynasty. According to cultural researchers, the image on the Dong Son bronze drums (700 BC - 100) showed that the ancient Vietnamese dressed the costume with two flaps. This type of dress was commonly used by women from 2000 BC until 200 AD. This period the Ao Dai was not influenced by Chinese culture. Looking at the patterns of the costumes on the Dong Son bronze drums, one can find the familiar features of the modern ao dai today. 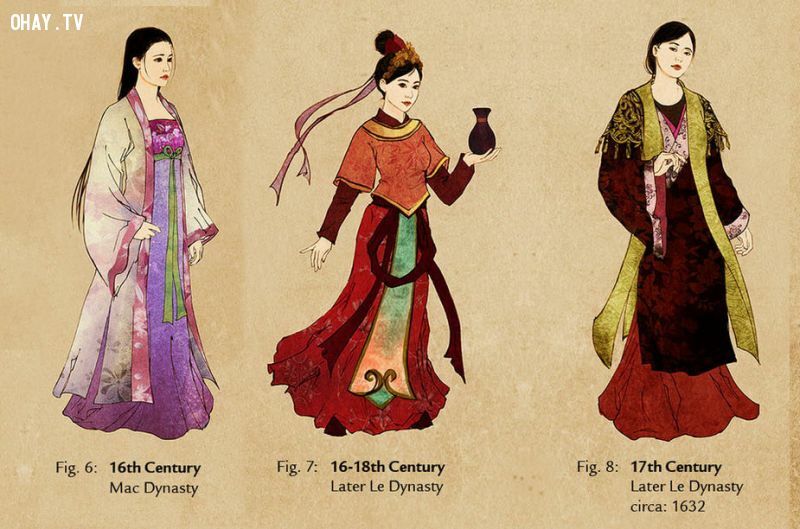 The evolution of the Ao Dai in the Tran – Le dynasty. From the Ly Dynasty, the 11th to 12th century, Vietnam was dominated by Chinese feudalism so the Ao Dai was partly influenced by Chinese culture. The costume had 3 to 5 layers, probably due to the cold climate of the North, and because of the climate factor, the details like a scarf were also fully used. In this period, a common feature was that the sleeves were large and long. Along with that, the most common hairstyle of the women was the high bun. However, in the 16th – 18th century, women began letting their hair down. The costume still had many layers, but overall they were somewhat more gentle and serene. The Ao Dai in the 16th– 17th century. 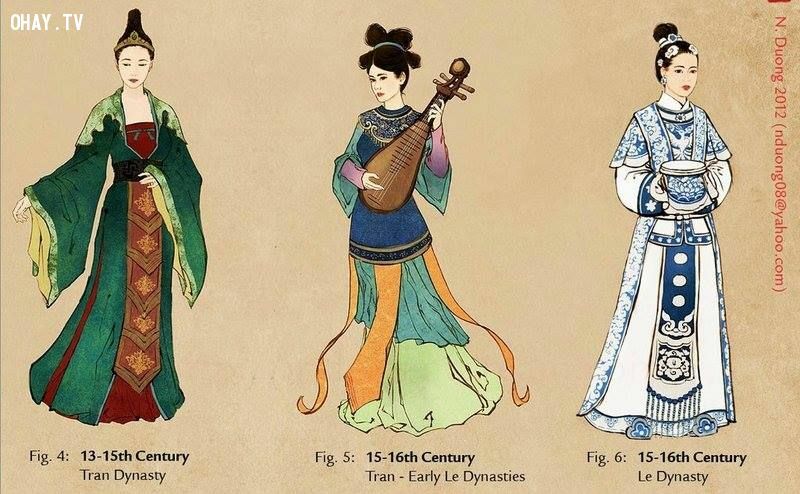 Under the Le dynasty, the costume changed the most. It constantly evolved and was very different from the previous outfits. In this period, the Ao Dai was the four flap dress, similarly the four panel traditional dress of the later period but the two front panels were not tied together like the later style. Women at that time wore the four-flap Ao Dai outside the brassiere. They gathered their hair into a bun or rolled the hair around their head and wore a hat with long bird feathers. Later they replaced the hat with a scarf or the palm-leaf conical hat. To facilitate farm work or daily activities, this kind of Ao Dai became the four panel traditional dress. The four panel traditional dress (Ao tu than) was wore outside the long skirt to enable women at work. The Ao tu than was appropriate for rural women who worked diligently all year round. For the women in small towns and cities, Ao tu than was reformed into Ao ngu than (five panel dress). The Ao Dai in the Nguyen Dynasty to the mid twentieth century. In the Nguyen Dynasty, Lord Nguyen Phuc Khoát was the one who shaped the Vietnamese Ao Dai today. 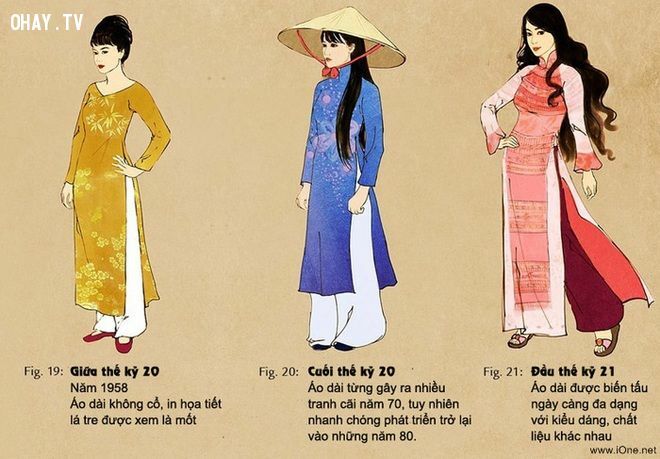 Facing the wave of "immigration" of tens of thousands of Minh Huong people, to preserve Vietnam’s cultural identity, Nguyen Phuc Khoat issued a decree on the dress for all people in Cochin. This decree identified the shape of the Ao Dai for both the women and men, which are similar to the Ao dai today. The Ao Dai became the official national costumes under the reign of Loard Nguyen Vu Vuong in 1739-1765. The breakthrough that contributed to the formation of the modern Ao Dai was the "Le Mur" Ao Dai, designed by painter Cat Tuong in 1939. Unlike the traditional Ao Dai, the Le Mur Ao Dai holds close to the body curve, with many European details. This Ao Dai was criticized by the public opinion at that time for its sexiness and only the fashionable artists dared to wear it. From 1943 this style was neglected. In the 1960s, Dung Tailors in Saigon created the Ao Dai with the raglan sleeves. Since then the modern Ao Dai has been shaped. 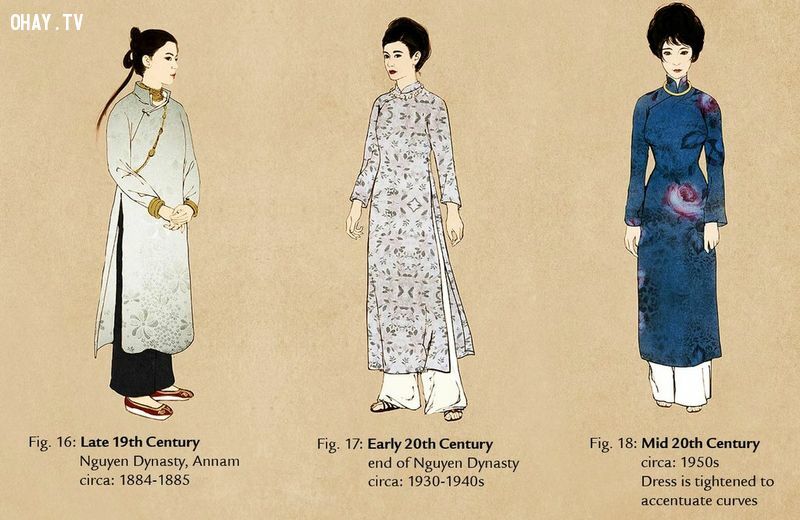 The Ao Dai from the mid-20th century to the early 21st century. In the early 1960s, Mrs. Tran Le Xuan, Ngo Dinh Nhu's wife, designed the open-collar Ao Dai. The famous Ao Dai called Madame Nhu Ao Dai was criticized at that time for going contrary to tradition. Today, this kind of Ao Dai is favored for its comfort and its suitability to a tropical climate. In the 1960s, the Ao Dai holding close the body curve that challenges the traditional views became fashionable. At the end of the 60s, the mini Ao Dai become prevalent among the school girls because of its comfort, convenience. 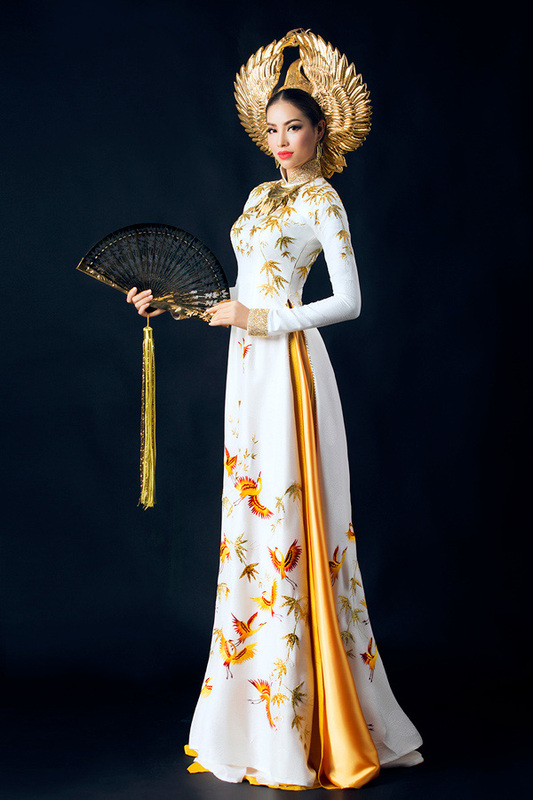 This style of Ao Dai has narrow flaps which are short to the knee. Pham Huong’s ao dai at the Miss Universe 2015 pageant. After the 1970s, the Ao Dai gradually disappeared on the streets. However, since 2000 Ao Dai has returned with a variety of designs, and different materials through the collections of Vietnamese innovative and alternative designers like Vo Viet Chung, Si Hoang, Thuan Viet... The Ao Dai is reformed to fit with jean trousers. It is always the first choice of the Vietnamese representative at international beauty contests. The traditional ao dai worn by Pham Huong, Tran Ngoc Lan Khue and Pham Thuy Van ... impressed international audience.